I spent the weekend working at a toy store, watching great films with friends, watching more "Powerpuff Girls" episodes than a person should in one sitting, and playing with Oz, the wonder pup. I want to live in a bed right now. This week I am working 40 hours and Monday- Sunday. Talk about a change in schedule. Hopefully it will prove advantageous. 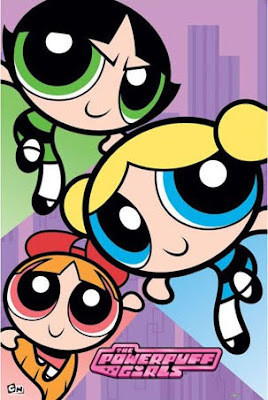 I must say - "The Powerpuff Girls" are therapeutic. I am not happy today, not really sad, not panicky, just here.